"I hope you haven't been showing off — it's rude." 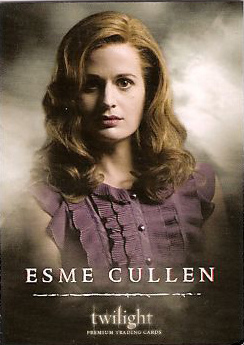 Esme Cullen was born sometime in 1895. She lived near the outskirts of Columbus, Ohio. She met Carlisle Cullen for the first time when she broke her leg climbing a tree when she was sixteen, and never forgot the experience. At the age of twenty-two Esme married Charles Evenson, but soon realize he was an abusive man. He abused her, but she kept quiet hoping to be a good wife. Much to Esme's relief, her husband got drafted during World War 1. Charles came back from the war in 1920, and abused her greatly. Esme ran away from him and soon realized she was pregnant. Soon after her son was born he died of a lung infection. She felt that she no longer had a reason to live, and tried to commit suicide by jumping off a cliff. Esme was presumed dead when she was brought to the morgue but her heart was still beating faintly, so Dr. Carlisle Cullen changed her into a vampire when he reconized her as the happy, beautiful young girl he treated ten years earlier. After the transformatiion Esme and Carlisle fell in love Esme joined the coven in 1921, and later married Carlisle. Elizabeth Ann Reaser was born on June 15, 1975 in Bloomfield, Michigan. She is an American film, television, and stage actress. She is best known for playing Esme Cullen in the Twilight Saga. Elizabeth is the daughter of Karen Davidson and John Reaser. She was the middle child of three sisters. Reaser is a graduate of the Juilliard School, and also attended the Academy of the Sacred Heart in Bloomfield Hills. Her work includes the films "Stay", "The Family Stone", and "The Twilight Saga", and the TV series "Saved", "Grey's Anatomy", and " The Ex-List". 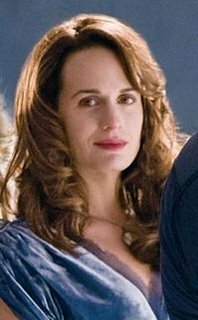 Reaser earned the "Jury Award" at the Newport Beach Film Festival in 2006 for her work in the film "Sweet Land", and was nominated for an Independent Spirit Award as "Best Female Lead" for the same part in 2007.